With the party season upon us, I thought you might like to have a taste of the Dirndl fashions that the well-dressed Bavarian lady is wearing this season. 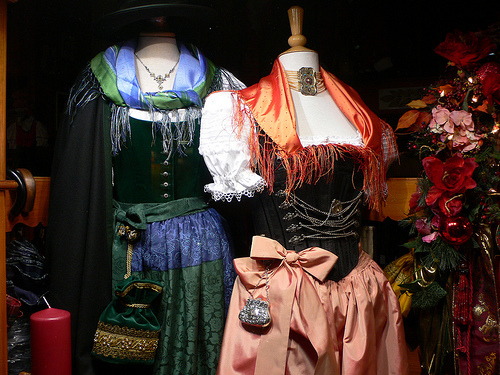 On my recent visit to Munich, I was intrigued by the number of classy shops showing evening dress in traditional Bavarian style in their shop windows. Where you or I might choose a little something by Valentino or Versace for our big night out, the ladies of Munich clearly enjoy sporting their Bavarian traditional dress in gorgeous silks and velvets. Apparently, the dirndl is the outfit of choice for any formal evening events, a visit to the Opera or any social event with a traditional flavour.